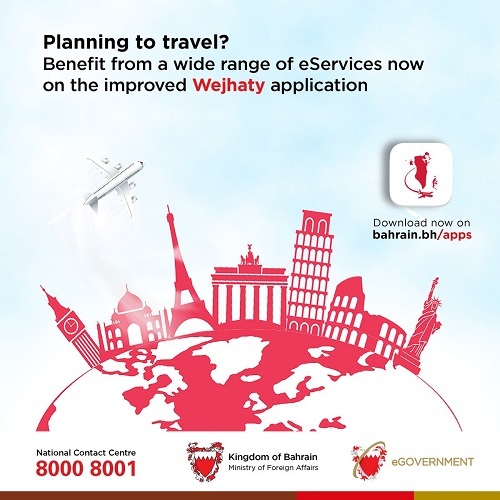 Wejhaty is a free service provided by the Ministry of Foreign Affairs to assist all Bahraini citizens planning, living or studying abroad. It allows to register and update your personal information to communicate in case of emergency (Natural disaster, Civil unrest or Emergency Evacuation), updating Bahrainis living or studying abroad of any relevant new rules and regulations, receiving updates/feedback from Bahrainis abroad about any relevant issues, and communication of Ministry of Foreign Affairs (MOFA) through its embassies around the world with the Bahraini citizens abroad. How do I register in Wejhaty ? It only takes a few minutes to register your contact details and travel plans. Wejhaty is targeted only for Bahraini citizens. You will need to register an e-Key. Nationality authentication will be done based on e-Key and Personal Number from CIO.